Promotions in the military are rigorous and never assumed. Across all branches of the U.S. Armed forces there are high standards for both officers and enlisted service members who are aiming for a promotion. Promotions within the officer ranks are especially fierce, as these men and women have higher amounts of responsibility and their decisions impact a greater amount of service members. In fact, reaching the leadership level of an O-7, Brigadier General (Rear Admiral Lower Half for the Navy and Coast Guard) is a major milestone accomplishment. Only a very small percentage of elite service members achieve promotion into the General Officer ranks (O-7 and above) and their career path is a combination of clearly defined steps and their ability to maintain their competitive edge. Every officer in the U.S. military starts out at the most junior level which is an O-1 and is either a Second Lieutenant (Army, Air Force, Marine Corps) or an Ensign (Navy and Coast Guard). All officers, regardless of branch of service must obtain a college degree and receive their commission prior to entering the pay-grade of O-1. Once an officer enters military service the promotion ladder is standard up to an O-6 and outlines certain criteria that each officer must meet in order to be eligible for promotion. Primary eligibility criteria includes Time in Service and Time in Grade among other qualifying factors. Time in Service is the cumulative amount of time a service member has rendered in service to the U.S. Armed Forces. On the other hand, Time in Grade is the amount of time a service member has spent in their current pay-grade such as O-1. For example, in order to be promoted from O-3 to O-4 a service member must have served a minimum of 10 years and should have spent at least 3 years as an O-3. 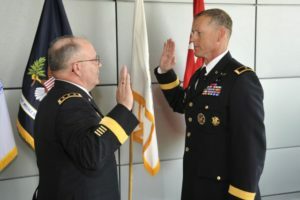 Once a service member reaches the pay-grade of O-6 and is seeking promotion to O-7, the first level of the General Officer/Flag Officer ranks, promotion criteria becomes much more demanding. Officers seeking promotion to O-7 and above must meet several pre-requisites such as an age limit requirement and Joint Duty Assignment. Specifically, all General Officers must adhere to the mandatory retirement age of 62; thus, officers seeking promotion to O-7 and above must be younger than 62 years old. Also, prior to earning a promotion to O-7 officers need to have completed a Joint Duty Assignment tour in which the unit they were responsible for commanding was made up of service members from two or more branches of the U.S. military. In addition, officers seeking promotion into the General Officer or Flag Officer ranks will be reviewed by a specific promotion board primarily concerned with promotions within the General Officer ranks. These promotion boards take into consideration past accomplishments and leadership roles plus the needs of the branch of service the officer supports. Finally, the promotion board makes a recommendation to the President of the United States. If the President accepts this recommendation they will nominate the officer for promotion. However, once the President communicates this nomination, the U.S. Senate must confirm it in order for the promotion to be approved. This process includes promotions from O-6 to O-7 and O-7 through O-10. The path to achieving promotion into the General Officer / Flag Officer ranks is a challenging but feasible goal. Officers who carefully map out their career, seek out advancement for personal and professional development, and embrace challenging assignments can certainly reach the ranks of General Officers before the mandatory retirement age.